I read this article and found it very interesting, thought it might be something for you. The article is called The Long Road To Basic Amenities In India’s Schools and is located at https://archive.indiaspend.com/sectors/the-long-road-to-basic-amenities-in-indias-schools. The Supreme Court recently directed the federal government and the state governments to provide basic amenities, including drinking water and toilet facilities, in all government and private schools within six months. IndiaSpend’s Sourjya Bhowmick looks at the 2010-11 data of the District Information System for Education (DISE), which covers government & private schools, and finds that the task is arduous with Chhattisgarh, Bihar, Jharkhand and Orissa having the least educational infrastructure. Surprisingly, 83% of Indian schools have functional computers while only 43% have electricity connection. The Supreme Court judgment is based on a writ petition filed in 2004 and several interim orders (Oct 18, 2011 and Dec 12, 2011) given to the states to provide toilet facilities, drinking water and other necessary infrastructure for schools. 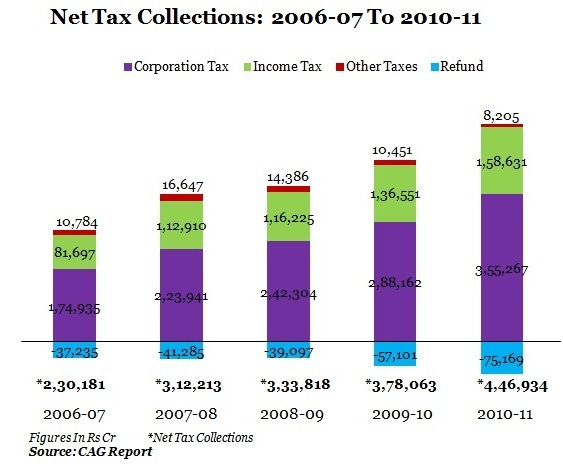 From the graph, you can see that the total does not reach 100%. The reason, as stated by DISE, is because of missing values and rounding of figures. While the number of government schools increased by around 16,558 in 2010-11 (an increase of 1.5%), the percentage share of government schools has gone down by 2% because of the addition of over 10,000 private schools. The indicators that will be taken for this article are schools having drinking water facilities, functional girls’ toilets, functional computers, electricity connection and the average dropout rate. 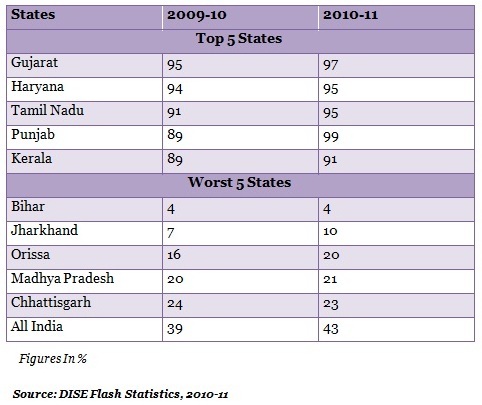 The best 5 performing states and the worst 5 states are being taken into account. 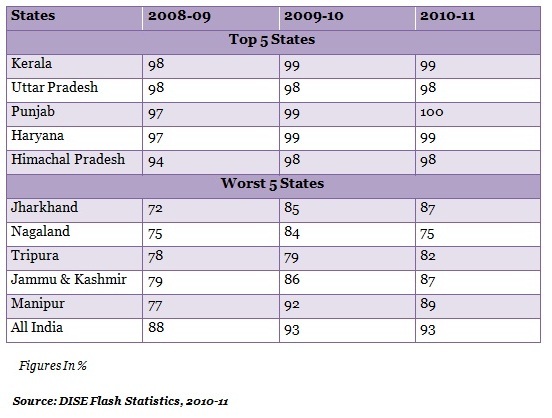 Table 1 shows that states have been doing well in providing drinking water in schools. 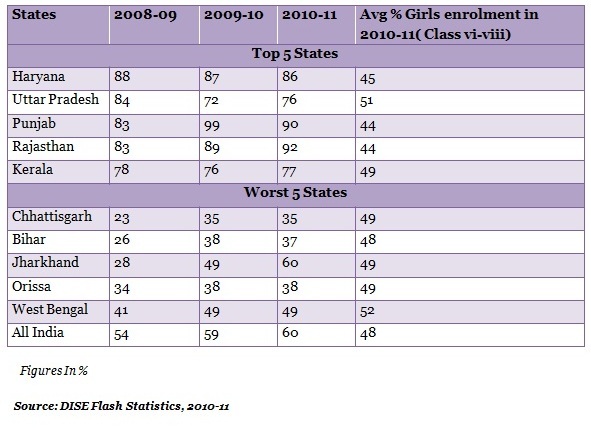 Even states in the bottom 5 have improved in the past two years. While over 93% of Indian schools have access to drinking water, 7% schools still do not have access to this basic infrastructure. 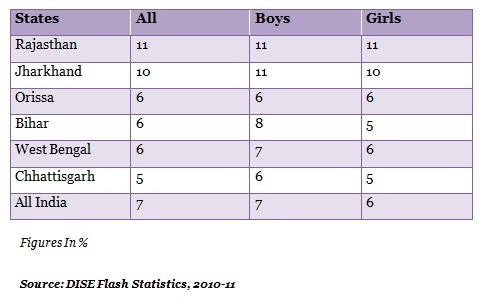 Table 2 shows that Jharkhand has been quickly building girls’ toilets in schools. While Chhattisgarh is the worst performer now (with only 35% schools with girls’ toilets), Rajasthan has the best number (92%). It is highly likely that it will be a daunting task for many states to meet the Supreme Court order of building toilets in all schools within six months. A surprising observation here is that access to toilet facilities does not have any direct relation with girls’ enrolment in schools. While over 60% schools across the country have girls’ toilets, enrolment of girls continue to be low at 48%. Let us now look at another important infrastructure – electricity to run basic facilities like lights and fans and also computer-based teaching aids. So, over 95% schools in Gujarat have electricity connection while only 4% schools in Bihar have access to power. The all-India average of electricity connection in schools is only 43%. Another key indicator to look at now is functional computers in schools. The DISE document does not mention the number of computers that should be functional in every school. 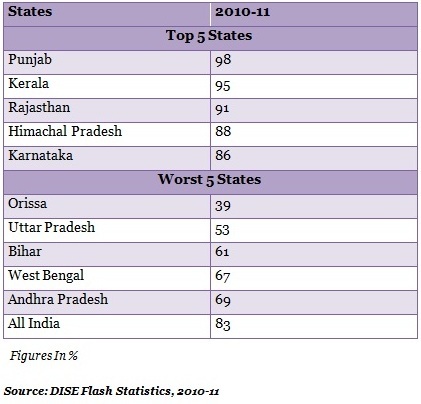 While Punjab is doing the best with 98% schools having functional computers, Orissa has the worst percentage (39%) of schools having functional computers. Surprisingly, 83% of schools have functional computers in India while 57% schools have no electricity connection! Rajasthan has the worst dropout rate in the country and the state figures only once in the infrastructure list – the state is among the top 5 when it comes to schools with girls’ toilets. Other states like Orissa and West Bengal, which do not have good infrastructure, however are able to retain students in schools. So, apart from the Supreme Court-mandated facilities like drinking water and toilets, schools across the country are lacking in other education infrastructure as well. While there have been many court directives in the past on such issues, a lot still needs to be done before India can claim 100% availability of education infrastructure. Providing basic infrastructure is tedious but is an imperative to ensure that children who are guaranteed a right to education also have the basic amenities – water, toilet, electricity – available to them so that they can learn and succeed.